The strike that stunned Stadio Olimpico: Cutrone liked it Raúl-style. In one corner: AS Roma. Playing at home. Having three straight league wins behind their back. Pocketing a precious, away Champions League goal from frozen Ukraine. Blessed with the thunderous form of Turkish wonderkid, Cengiz Ünder. Still well in the race for a third place finish. Going toe-to-toe with extremely troubled Inter and local rivals from Lazio. Stripped of wing-back Emerson Palmieri but not of deadly goalscorer, Edin Džeko. Defensively – the third best Italian team this year, with Alisson Becker collecting praise. In the other corner: AC Milan. Unpredictable. Random. 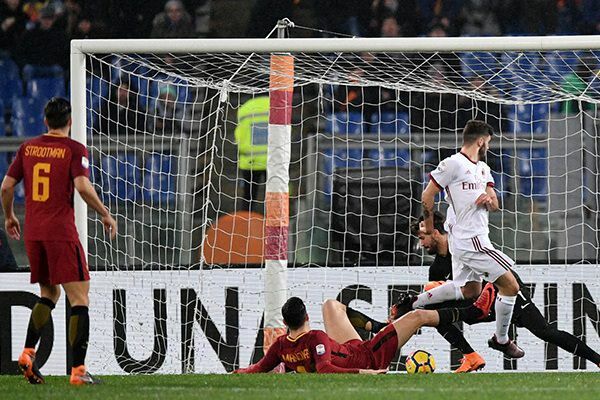 Without a single win in Roma’s lair since October 2011, when 31-years old Zlatan Ibrahimović and 36-years old Alessandro Nesta sealed a 3-2 triumph. Struck by the awful news of their Chinese owners’ bankrupcy which has been declared just a week ago. Stuck with Sampdoria in a rather pathetic race for the sixth place finish and yet another Europa League qualification. At the same time: still undefeated in the year 2018 and actually going from strength to strength under Gennaro Gattuso. On a Sunday night, all these factors and patterns were supposed to come into play. Roma, with hosts’ advantage, stronger squad, more to play for and an extra rest day after last European outing, were the favourites. For 45 minutes, they were even proving it on the pitch. It only took five minutes for Gianluigi Donnarumma to make the first save of the night, seventeen minutes to be forced by his own defender to win a dribble in Rossoneri’s penalty box and twenty four minutes to display miraculous reflexes at handling Schick’s volley. The hosts had a very simple plan for this part of the match. Using the attacking potential of Diego Perotti and Aleksandar Kolarov, they flooded their left flank, pushing Davide Calabria to the limit and looking to stretch Milan’s defense. The former Man City wing-back once again proved that he’s found second youth in Italy. It took him less than a minute to play first dangerous cross and he provided more of the same from a free-kick which resulted with the aforementioned Schick’s shot. At half-time, this all looked very promising for Giallorossi. Gattuso: “My work is to be the players’ nightmare until the end of the season”. Whether that was Gattuso’s half-time team talk, a pre-planned strategy to hold out until the second half or Roma’s lack of concentration – the second half has turned out drastically different. It took less than 120 seconds for Suso to turn the game upside down. The Spaniard did so with a Coutinhoesque move, turning Kolarov, getting the ball to his left foot and playing a world-class cross into Cutrone’s path. The young forward only flicked it slightly with his heel and went into the back of the net, evading both Manolas and Alisson. This came as a shock for the hosts – and Rino’s lads were not taking their feet off the gas. Six minutes after the breakthrough, Hakan Çalhanoğlu’s headed clearance allowed Suso to spread the ball wide to Franck Kessié and instigate another dangerous counterattack. The Ivorian fired his shot straight at Alisson – but that was just the beginning of Roma’s trouble. Pumped and ambitious, Milan were soon boosted even further by the inclusion of Nikola Kalinić. In the end – this was the masterpiece of a substitute which completely broke ASR. The Serbian poacher didn’t have the best time this season. His last league goal happened back in December, in an embarrassing draw against doomed Benevento side. Recently, he had a poor cup game against Lazio (0-0) and two appearances off the bench, in Udine (1-1) and Razgrad (1-0). In Rome, he’d miss a big chance just five minutes after entering the fray, when Alisson blocked his long shot and Romagnoli fluffed the rebound. The ex-Fiorentina man didn’t give up though; two minutes later, his pass sealed the victory. 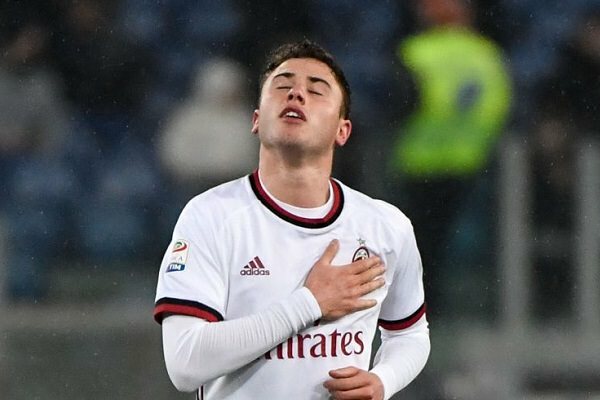 Calabria, who took advantage of that final ball, impressed yet again. Prior to this season, the 21-years old lad was destined to watch Andrea Conti off the bench, as his club’s board splashed £22.5 million for the services of Atalanta right-back. Conti, injured since September, is now in the final stages of his cruciate ligament treatment but he’ll have hard time competing with his younger colleague, who contributed 1 goal, 2 assists, 24 (!) successful tackles and 10 interceptions in his last five matches for Milan. Coming-of-age: Davide Calabria is quickly becoming the player Davide Santon has failed to be. For Roma, those two gutting blows could not have come at a worse time. Scheduled to play Napoli at San Paolo next, Di Francesco’s team has found itself in a seriously vulnerable spot and in a sudden crisis of form. This time, young Cengiz Ünder had a mediocre performance. So did Radja Nainggolan, who whose runs from the midfield usually provide an extra attacking dimension. Without it, the hosts were reduced to firing long shot, ending the game with 18 attempts but only three of those on target. The manager did not help the team by risking it all and putting Edin Džeko on the bench. The Bosnian, who’s been rumoured to be Milan’s #1 transfer target for the summer of 2018, ended up replacing Nainggolan in the 64th minute. After that, he didn’t have a single shot on Donnarumma’s goal; worse – he couldn’t even win a single header against absolutely indomitable Romagnoli. By the end of the game, the visitors’ centre-back partnership has allowed Roma’s leading forward to get merely ten touches on the ball. No wonder he couldn’t score his 12th league goal. What does this result change? In terms of the league table, not much: even after Inter’s and Lazio’s wins, Roma are still well in a race for the third place and Milan, six points behind, still fight for the final Europa League spot. 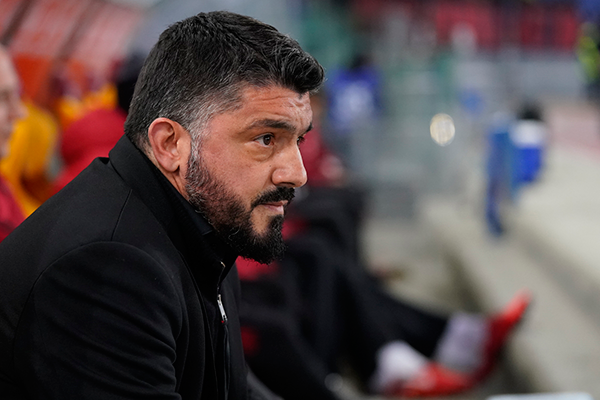 However – first success at Stadio Olimpico in over five years should further cement Gattuso’s position as a head coach. It seems that after Seedorf, Inzaghi, Mihajlović and Brocchi, Rossoneri finally discovered their ex-player with both the knowledge and the guts to lead them. "Arsenal lost today, but we are not Manchester City. We've got to put our helmets on and go into battle." “We must continue playing like we are and keep up the enthusiasm. We must not be afraid and be aware of our limits. We have to bring this team back to where it has been for so many years” – said Rino immediately after the game. Indeed – from his perspective, going from the Champions League wins to mid-table mediocrity in just a decade must’ve been a highly upsetting experience. Turning the ship around wasn’t easy either: before Gattuso instilled winning mentality in the lads, they’ve gone through a humiliation in Verona and a painful home loss to Atalanta. Today, they’re finally looking stronger than ever. The actual challenge is still ahead of them, though. In the next three weeks, they’ll play six games, including a cup rematch with Lazio, the Europa League tie against Arsenal, the derby against Inter and a visit at Stadio Luigi Ferraris, which has been Genoa’s fortress recently. Although there’s an off-chance that Milan will come away victorious six times and stun the world, it’s far more likely that we’ll only see their full potential next year, when Gattuso gets more time to work with the players.